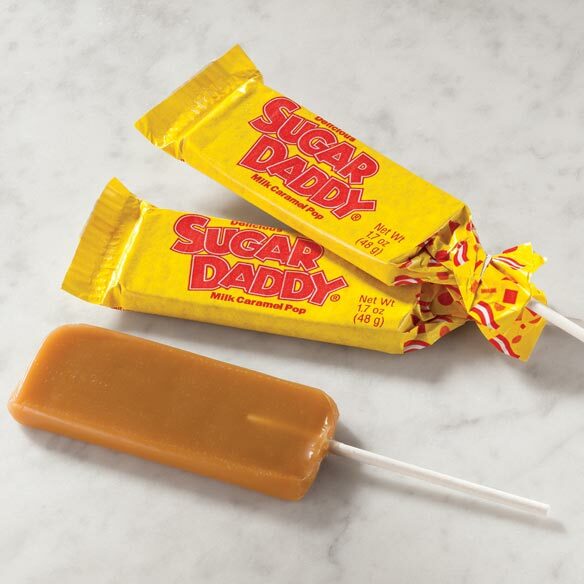 Sugar Daddy Pops Jr. - 15 oz. Remember working on one of these yummy caramel pops for hours, then parking it on its wax-paper wrapper so you could enjoy it again the next day? The buttery, milk caramel pop is still the “Daddy” of all candy-counter treats ... luscious, long-lasting fun on a sturdy, little stick. Includes 30 pops. these suckers reminded me of my youth. I bought them for my grandchildren who love caramel. Just like the Big Daddy sucker you bought at the movies and still had half of it to eat before dinner. The rich, buttery, smoothly comforting candy that made everything OK. I order them over and over again if I can't find them locally. Comfort on a stick. If papa's happy, everybody is happy. My husband absolutely loves these suckers. I aways buy my candy here. Great candy that is hard to find in stores. Loved them, just like when I was a kid! These are great and really bring back memories. Great old treat at new smaller size. Seriously.... these are awesome treats for company or just yourself! I'm enjoying them very much. They recall to mind the old days when people took time to enjoy life! Thanks for making such a sweet product at a reasonable price. ?? Any time you have a taste for a good. Tasting piece of candy. I used it for snacking time but the product was tasty but disappointed because they not what I expected at all too small so I really did not enjoy it much . They no longer sell the large Sugar Daddy pops in stores. Have always been my favorite candy for 60 years. Granddaughters will love. Brings back memories! My husband and I have always liked these. I like the jrs.more than the larger pops. Old time candies. Very tasty. I remember these from childhood & I love them!!! I love them and they are hard to find around here. I have been eating these for over 60 years. My favorite. because I have been to so many freaking stores and they don’t have them and I have been craving them! This used to be one of my favorites when lil. I have not seen them around in a long time. Because as a child I really enjoyed this candy and still do just hard to find at stores.